Birch Bayh, Former Democratic Senator From Indiana, Died Thursday Sen. Birch Bayh, D-Ind., authored Title IX, a law guaranteeing women access to educational and athletic programs in higher education. He died Thursday at the age of 91. Former Sen. Birch Bayh, D-Ind., died at the age of 91 on Thursday. He served three terms in the Senate, from 1963 to 1981. 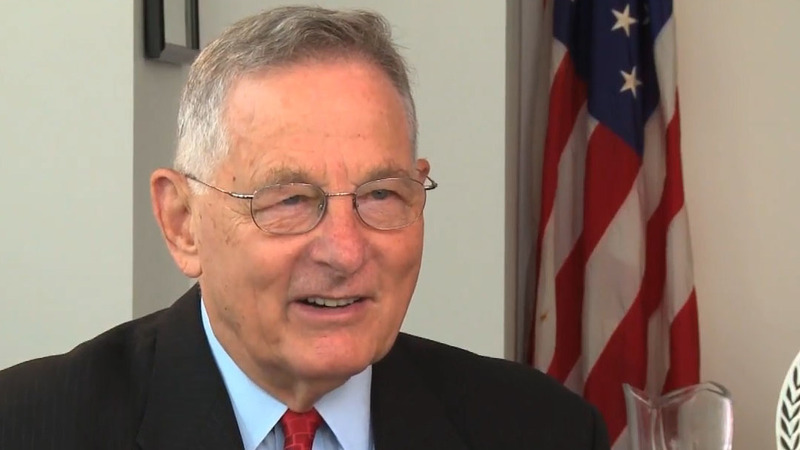 Former Indiana Sen. Birch Bayh died Thursday morning at the age of 91. He was an icon in Indiana and a titan of the U.S. Senate, serving three terms from 1963 to 1981. Among his accomplishments was his authorship of Title IX in 1972, a law guaranteeing women access to educational and athletic programs in higher education. Bayh said his inspiration for that – and his work on the failed Equal Rights Amendment – was his wife Marvella. They met at the 1951 National Farm Bureau speaking contest; as Bayh put it, "She won the competition, I won the girl." In an interview in 2011, Bayh said Marvella was denied admittance to the University of Virginia solely because of her gender. "The most egregious problem confronted by young women and not so young women in our country was being denied full educational opportunity," Bayh said. Marvella Bayh was diagnosed with breast cancer in 1971, and after her cancer was in remission, she became a spokesperson for the American Cancer Society before her death in 1979. The effect of Title IX is still felt widely today, by people like Tonya Pfaff. She's now an Indiana state lawmaker who serves in the same seat Bayh once held. "Thanks to the ripple effect of Title IX, I personally was awarded a basketball scholarship to West Point," Pfaff says. The ripple effect is maintained by the flexibility of the measure, says Michella Marino, deputy director of the Indiana Historical Bureau. Title IX's full text is only 37 words. "But I think that's the genius of it too, that it has evolved over the decades to address needs that need to be met," Marino says. Bayh's legacy also includes his work helping craft the 1964 Civil Rights Act and the 1965 Voting Rights Act. He worked alongside his longtime friend Sen. Ted Kennedy. That relationship was cemented in 1964 when Bayh dragged Kennedy to safety — "like a sack of corn under my arm," he said — after a small plane they chartered crashed in Massachusetts. I don't even think of him as a Democrat — I just think of him as a great Hoosier. Bayh is also the only person since the Founding Fathers to author two amendments to the U.S. Constitution: the 25th Amendment, laying out presidential succession, and the 26th, which lowered the voting age to 18. Bayh said the latter was driven by the war in Vietnam. "Where you had young men giving their lives in a battle that they couldn't even vote for the people that sent them there," Bayh said. His work to lower the voting age dated back to his time in the Indiana legislature, where, at age 30, he was the youngest Speaker of the House in the state's history. Current Speaker Brian Bosma – a Republican – says Bayh's legacy transcends party labels. "I don't even think of him as a Democrat — although I know he was a Democrat. I just think of him as a great Hoosier," Bosma says. Bayh said his ability to work across the aisle fueled his political career. "Whatever success I may have had in the Senate is because I had strong support among my colleagues in the Democratic Party and [from] the Republicans as well," Bayh said. "And I didn't think that was unusual." Bayh was also the author and co-sponsor of the Bayh-Dole Act, which enables universities and small businesses to gain ownership of federally-funded copyrights. In 1965, Bayh wrote relief legislation that became the foundation for the Federal Emergency Management Agency (FEMA). That approach — that idea that I'm not going to hide my beliefs, I'm simply going to explain them to you and engage with you in a conversation — is something that, I think, people in Indiana can be proud of. Former Rep. Lee Hamilton, another Indiana political legend, says his friend of more than 50 years changed the way Indiana politicians campaigned. "He would stand for example at the corner of the stoplight in Nashville, Ind., when the trees were turning color and the cars would be backed up for miles," Hamilton said. "And then he'd go down the line and shake hands with people in every car. He just never stopped campaigning." Lee says there was only one thing Bayh would stop campaigning for: ice cream. "He loved Dairy Queens. He knew every Dairy Queen in the state of Indiana," Hamilton says. "We would drive through Osgood, Ind., at 10 o'clock at night, and he'd say 'Lee, that place doesn't close 'til 10:30. Let's stop for a Dairy Queen.'" Andy Downs, director of the Mike Downs Center for Indiana Politics, says that Bayh's approach to politics is as much a part of his legacy as his federal legislation. "That approach — that idea that I'm not going to hide my beliefs, I'm simply going to explain them to you and engage with you in a conversation — is something that, I think, people in Indiana can be proud of," Downs says. Bayh was born in 1928 in Terre Haute, Ind., spending summers just west on his family's farm in Shirkieville. After his first year at Purdue University, he joined the Army in 1945 and served as a military policeman, starting a vegetable garden project with German children. He graduated from Purdue University in 1951 and won his first election in 1954. Bayh is survived by his second wife and two sons — one of whom, Evan, helped further cement the Bayh name in Indiana politics, by serving as governor and by eventually taking his father's U.S. Senate seat. Lauren Chapman and Barbara Brosher contributed to this report from Indiana Public Broadcasting.